Unquestionably, the most interesting piece of real estate on the entire planet today is the "mansion" compound where Osama bin Laden was found. As the New York Times reported, "It was hardly the spartan cave in the mountains that many had envisioned as bin Laden’s hiding place. Rather, it was a mansion on the outskirts of the town’s center, set on an imposing hilltop and ringed by 12-foot-high concrete walls topped with barbed wire. "The property was valued at $1 million, but it had neither a telephone nor an Internet connection," the Times wrote. "American officials believed that the compound, built in 2005, was designed for the specific purpose of hiding bin Laden." The Los Angeles Times has published a graphic showing property details, as well as satellite images from before and after the compound was built. The Associated Press reported that a doctor, Qazi Mahfooz Ul Haq, sold the land in 2005 where the compound was built, and The Telegraph reports that the contractor who allegedly built the complex, named in reports as Gul Muhammad, has been arrested near Abbottabad, Pakistan. The man listed as the buyer of the property may have been killed in the U.S. raid, AP also reported. 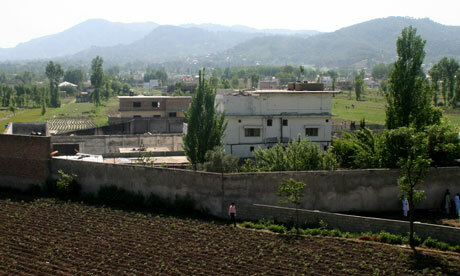 There is a photo of the compound (other photos in this Telegraph report), and a Guardian article discusses bin Laden’s family background in building and architecture.